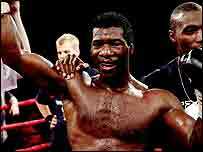 Carl Thompson stopped David Haye at Wembley Arena to retain the IBO cruiserweight title. Haye, a 23-year-old former World Amateur Championship silver medallist, dominated the first two rounds with sharps jabs and combinations. But veteran Thompson, 40, began to fight back in the third. Haye, who had never gone past four rounds, was sent to the canvas in the fifth and, after more punishment from Thompson, the towel was thrown in. Thompson has no thoughts of retirement as he plans to cash in on his title. "I'm showing age is no barrier," he said. "I've got my strength and I know what I'm in the sport for. I will fight anyone if people pay me the money. "I was on the receiving end for most of it and I know I'm not the most talented boxer in the world but I hung in there and will give anyone trouble." Haye was not too upset and admitted Thompson's experience had shown. "When I hurt him I could see in his eyes that he wasn't going. "I was slowing the pace down and letting him throw shots. As it happened he caught me with a few." "I would love to fight him again. I was actually enjoying being in there. It might be a loss on my record but I can come back." On the same card, Israeli heavyweight Roman Greenberg outclassed Vitaly Shkraba over six rounds to remain undefeated. Greenberg showed flashes of brilliance against the Belorusian but disappointed the 4,000 spectators with his lack of workrate and commitment against a game but limited opponent.